BANGI, 24 Dec 2013 – Students needed to have more than just good planning skills including knowing how to execute them if they want to be highly sought after graduates. Deputy Vice Chancellor (Academic and International Affairs) of The National University of Malaysia (UKM), Prof Dato Dr Noor Azlan Ghazali said they also needed to have measurable goals so as to know how well they have achieved them. Speaking at the UKM Students’ Representative appointment and oath taking ceremony here today, Prof Noor Azlan said he was willing to assist students come up with measurable framework while they are at the university. He said the students and the University’s goal have to be the same though they may differ in how things are done. Such differences should be aired at meetings or discussions between the student representatives and the university but decisions made have to be agreed and adhered to. Prof Noor Azlan said leadership is about making decisions that will improve everyone and was delighted that the student leaders are noble in their quest to tackle issues affecting all students. 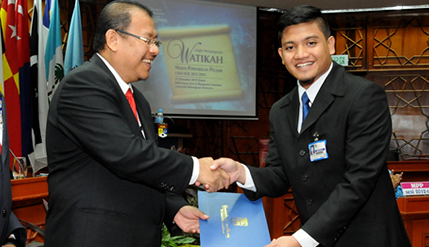 President of the Student Representative Council, Mustapha Kamil Husen Abd Kadir, detailed various aspects of the students that the Council intend to tackle including welfare, intellectual development, celebrating the diversity of cultures, unity and internationalisation in efforts to bring out graduates having a holistic stance. Present at the oath taking ceremony, was Deputy Vice Chancellor (Student and Alumni Affairs), Prof Dato’ Ir Dr Othman A Karim, faculty deans, principals of colleges and students.